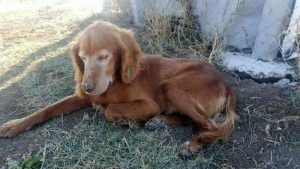 As Good as Gold is now working with a rescuer in Turkey who takes possession of dogs from shelters and feeding stations. This conservator along with volunteer foster parents care for them until they can be adopted in Turkey or transported to the United States for rehoming. Chester, who is thought to be about ten years old, was found living in a garbage dump. 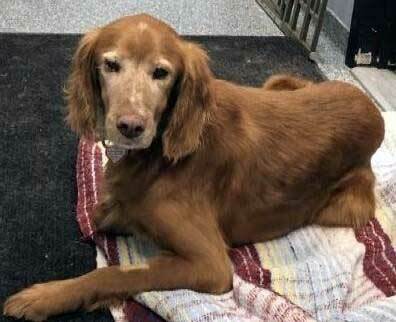 After being observed in Turkey for several weeks, he was deemed physically ready to travel to Chicago with his two canine companions and their human chaperone. At the airport, they were enthusiastically welcomed by Jim and Nickey King, Mike Flynn, Vickie Kukulski and Marlene Pedone. Chester readily hopped into the Backseat of one of the cars and enjoyed a ride to his intake exam. This friendly senior had some medical conditions that had to be addressed. He had surgery to remove two small eyelid tumors and a mass on his inner thigh. Three teeth were also extracted. The biopsy on the thigh mass revealed that it was a low grade sarcoma. Dr. Alexis Newman advised, “There is no way to know how long it may be before there is any cause for concern for regrowth, but hopefully it could be many, many months and not sooner.” In any case, it is not likely to metastasize to other areas and if regrowth should occur, it will be slow. Several days later, Vickie Kukulski delivered Chester to foster parents Jodi and Ken Phillips. Unfortunately, Chester had a relapse and had to return to the veterinary hospital. After receiving three days of TLC, Chester was eating well, his stomach upset was resolved, his pain was under control and he was wagging his tail at everyone including the office cat! He was ready to roll with his new foster moms, Judy Bartolini and Vickie Kukulski. When he arrived at Judy and Vickie’s home, he was still on “Turkey-Time” and was most active during night hours and slept during the day. Now that he has become acclimated to CST, he is thriving on the household routine and he seems more content and comfortable. Chester is a charming house guest and even rings a bell to signal his intention to go out. Squirrels are kept at bay when the the mighty hunter patrols the perimeter of the yard. He loves walks and car rides, but is somewhat restricted in his activities for now while wearing his e-collar. A typical Golden, Chester is sweet and affectionate with laps being his favorite place to relax. He wants to be close to his moms and will “cry” if they are out of his sight. We can only hope that the stars are in alignment for Chester and his Tale of a wonderful Golden life continues for a long time. When I am with you, I don’t feel so alone.